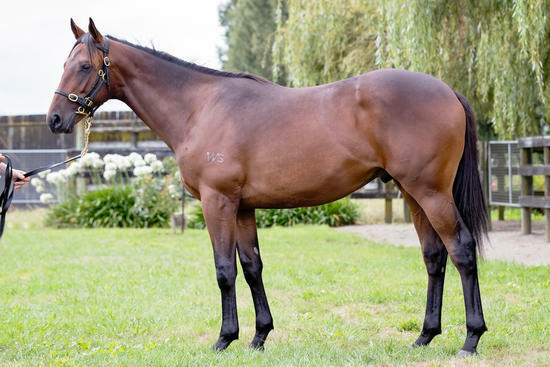 Introducing Lot 734 from the New Zealand 2018 Karaka Select Sale. A big, strong bay colt sired by the impressive Jakkalberry out of Bella O'Reilly, an unraced well bred, well related mare by O'Reilly. This is the mares first foal. JAKKALBERRY (IRE) (Bay 2006-Stud 2014). Champion Older Male Stayer in GB in 2012. 12 wins from 1900m to 2700m, Gran Premio di Milano, Gr.1, Meydan Dubai City of Gold S., Gr.2, Rome Premio Carlo d'Alessio, Gr.3, 3d VRC Melbourne Cup, Gr.1. Half-brother to SW Awelmarduk (Rome Derby Italiano, Gr.1), SW Crackerjack King (Rome Premio Presidente della Repubblica, Gr.1) and SW Kidnapping. Sire of SP Thomas Aquinas etc. His oldest progeny are 2YOs. If you wish to view or discuss the colt feel free to contact Colin on 0417 310 249. JAKKALBERRY (IRE) (Bay 2006-Stud 2014). Champion Older Male Stayer in GB in 2012. 12 wins from 1900m to 2700m, Gran Premio di Milano, Gr.1, Meydan Dubai City of Gold S., Gr.2, Rome Premio Carlo d'Alessio, Gr.3, 3d VRC Melbourne Cup, Gr.1. Half-brother to SW Awelmarduk (Rome Derby Italiano, Gr.1), SW Crackerjack King (Rome Premio Presidente della Repubblica, Gr.1) and SW Kidnapping. Sire of SP Thomas Aquinas and of Pressure, Botti, Gelignite Jack and of the placegetters Red Jakkal, etc. His oldest progeny are 3YOs. BELLA O'REILLY, by O'Reilly. Unraced. Half-sister to LA ROCKET, Macau Causeway, Voile Rouge. This is her first foal. LA ROCKET (Rock of Gibraltar). 6 wins from 1200m to 2000m, A$517,642, MRC St George S., Gr.2, Seymour Spring Classic, L, MVRC SAJ Cater Care Group H., MRC Aus Corp Signage Cup, 2d VRC Johnnie Walker S., L, MRC (Mornington) Lord S., L, VRC Comedy King H., Foletti & Keane H., MVRC Curran Chemicals H., Gorski Truck & Trailer Engineering H., MRC Kilsherry H., Euclase H., Traralgon Cup, 3d MVRC Stanley Wootton S., Gr.2, Seymour Cup, L, VRC Skipton H., MRC BMW Melbourne H., Hussonet H., Hussonet at Arrowfield H., MVRC Mayfair Smallgoods H., 4th MVRC Crystal Mile H., Gr.2. Macau Causeway (Giant's Causeway). 6 wins-1 at 2-from 1500m to 1850m, A$209,545, MVRC Anzac Appeal H., 2d VRC Gibson Carmichael S., L, Kyneton Cup, MRC Amounis H., Ararat Gold Cup, 3d SAJC Sires' Produce S., Gr.3, Allan Scott Park Morphettville H., Devonport Cup, MVRC Mayoral Charity P., MRC Winooka H.
Voile Rouge (Encosta de Lago). 5 wins to 1400m, A$152,903, HK$3,329,000, VRC Volunteer Fire Brigades H., MVRC Pulse Pharmacy H., HKJC Cumberland H., Begonioa H., 2d MRC TS Carlyon Cup, Gr.3, Harrolds Fashion P., MVRC Blue Ribbon Day P., MRC Over H., HKJC Berlin H., 3d SAJC Durbridge S., L, Hong Kong Macau Trophy, L, VRC George Watson H., HKJC Elite Youth Football Camp H., Cyber Colors H., 4th MVRC Red Anchor S., Gr.3. Victory Boys. 6 wins at 1650m, 1800m, HK$5,806,200, to 2017-18, HKJC Ninepin Group H., Suffolk H., Longchamp Racecourse H., Fortune Room H., KC Chinalink Bus H., Jardine's Lookout H., 2d HKJC Fantastic Light H., Holly H., Yan Chau Tong H., Hydrangea H., Australian Turf Club Trophy H., The King H., 3d HKJC Long Ke H., Collection H.
Pasabahce. 7 wins from 1150m to 1600m, NZ$106,588, to 2018-19, Waikato RC NZB Insurance Pearl Series H., Gordon Brewsters 90th Birthday H., BOP RC Dominator Garage Doors H., 2d BOP RC GPS-It Precision Mapping H., 3d BOP RC Seeka Kiwifruit H., Dominator Garage Doors H., Matamata RC Trac Sports Bar H.
Amos - Sparkling Talent (H.K.). 4 wins at 1000m, 1200m to 2017-18, HKJC Po Toi H., Tour and Hotel Service H., Battery Path H., 2d HKJC Changi H., 3d MRC Le Pine Funerals H., HKJC Luard H.
Tinkermosa. 2 wins at 1600m, A$92,075, in 2017-18, Murrumbidgee TC Southern Cross Guineas H., 2d ATC Theraces H., 3d ATC Blakes Marine H.
Ocean Knight. Winner at 2 in 2017-18, MRC Wellington RC 2YO H.
Dot Com. 15 wins from 1200m to 3000m, A$378,150, MVRC TROA Owner Privileges for a Day H., Kyneton Cup, MRC Le Pine Funeral Services H., Beer Street H.